Check valves are two-port valves, meaning they have two openings in the body, one for fluid to enter and the other for fluid to leave. There are various types of check valves used in a wide variety of applications. Check valves are often part of common household items. Although they are available in a wide range of sizes and costs, check valves generally are very small, simple, or inexpensive. Check valves work automatically and most are not controlled by a person or any external control; accordingly, most do not have any valve handle or stem. The bodies (external shells) of most check valves are made of plastic or metal. An important concept in check valves is the cracking pressure which is the minimum upstream pressure at which the valve will operate. Typically the check valve is designed for and can therefore be specified for a specific cracking pressure. Heart valves are essentially inlet and outlet check valves for the heart ventricles, since the ventricles act as pumps. A ball check valve is a check valve in which the closing member, the movable part to block the flow, is a spherical ball. In some ball check valves, the ball is spring-loaded to help keep it shut. For those designs without a spring, reverse flow is required to move the ball toward the seat and create a seal. The interior surface of the main seats of ball check valves are more or less conically-tapered to guide the ball into the seat and form a positive seal when stopping reverse flow. Ball check valves are often very small, simple, and cheap. They are commonly used in liquid or gel minipump dispenser spigots, spray devices, some rubber bulbs for pumping air, etc., manual air pumps and some other pumps, and refillable dispensing syringes. Although the balls are most often made of metal, they can be made of other materials, or in some specialized cases out of artificial ruby. High pressure HPLC pumps and similar applications commonly use small inlet and outlet ball check valves with both balls and seats made of artificial ruby, for both hardness and chemical resistance. After prolonged use, such check valves can eventually wear out or the seat can develop a crack, requiring replacement. Therefore, such valves are made to be replaceable, sometimes placed in a small plastic body tightly-fitted inside a metal fitting which can withstand high pressure and which is screwed into the pump head. There are similar check valves where the disc is not a ball, but some other shape, such as a poppet energized by a spring. Ball check valves should not be confused with ball valves, which is a different type of valve in which a ball acts as a controllable rotor to stop or direct flow. A diaphragm check valve uses a flexing rubber diaphragm positioned to create a normally-closed valve. Pressure on the upstream side must be greater than the pressure on the downstream side by a certain amount, known as the pressure differential, for the check valve to open allowing flow. Once positive pressure stops, the diaphragm automatically flexes back to its original closed position. 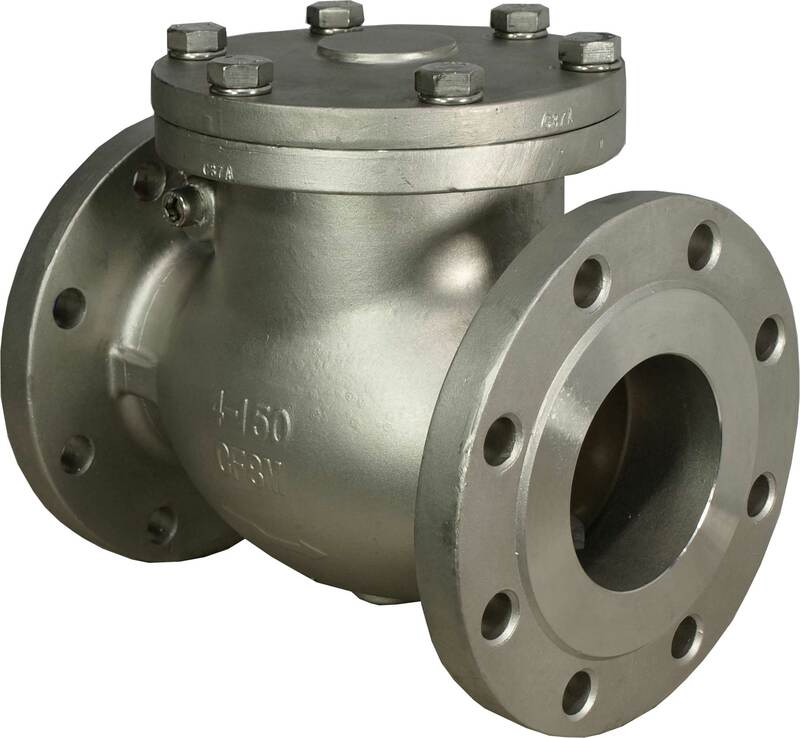 A swing check valve or tilting disc check valve is check valve in which the disc, the movable part to block the flow, swings on a hinge or trunnion, either onto the seat to block reverse flow or off the seat to allow forward flow. The seat opening cross-section may be perpendicular to the centerline between the two ports or at an angle. Although swing check valves can come in various sizes, large check valves are often swing check valves. The flapper valve in a flush-toilet mechanism is an example of this type of valve. Tank pressure holding it closed is overcome by manual lift of the flapper. It then remains open until the tank drains and the flapper falls due to gravity. Another variation of this mechanism is the clapper valve, used in applications such firefighting and fire life safety systems. A hinged gate only remains open in the inflowing direction. The clapper valve often also has a spring that keeps the gate shut when there is no forward pressure. Another example is the backwater valve (for sanitary drainage system) that protects against flooding caused by return flow of sewage waters. Such risk occurs most often in sanitary drainage systems connected to combined sewerage systems and in rainwater drainage systems. It may be caused by intense rainfall, thaw or flood. 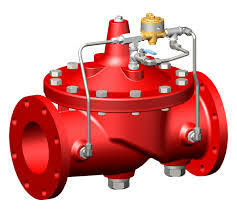 A stop-check valve is a check valve with override control to stop flow regardless of flow direction or pressure. In addition to closing in response to backflow or insufficient forward pressure (normal check-valve behavior), it can also be deliberately shut by an external mechanism, thereby preventing any flow regardless of forward pressure. A lift-check valve is a check valve in which the disc, sometimes called a lift, can be lifted up off its seat by higher pressure of inlet or upstream fluid to allow flow to the outlet or downstream side. A guide keeps motion of the disc on a vertical line, so the valve can later reseat properly. When the pressure is no longer higher, gravity or higher downstream pressure will cause the disc to lower onto its seat, shutting the valve to stop reverse flow. An in-line check valve is a check valve similar to the lift check valve. However, this valve generally has a spring that will 'lift' when there is pressure on the upstream side of the valve. The pressure needed on the upstream side of the valve to overcome the spring tension is called the 'cracking pressure'. When the pressure going through the valve goes below the cracking pressure, the spring will close the valve to prevent back-flow in the process. 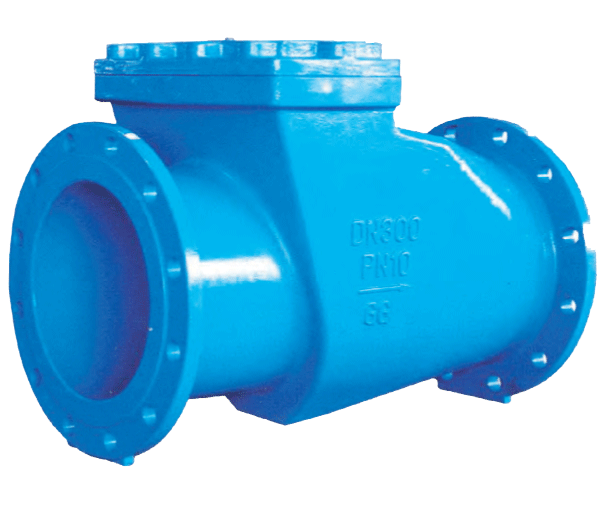 A duckbill valve is a check valve in which flow proceeds through a soft tube that protrudes into the downstream side. Back-pressure collapses this tube, cutting off flow. Multiple check valves can be connected in series. For example, a double check valve is often used as a backflow prevention device to keep potentially contaminated water from siphoning back into municipal water supply lines. There are also double ball check valves in which there are two ball/seat combinations sequentially in the same body to ensure positive leak-tight shutoff when blocking reverse flow; and piston check valves, wafer check valves, and ball-and-cone check valves. Check valves are often used with some types of pumps. Piston-driven and diaphragm pumps such as metering pumps and pumps for chromatography commonly use inlet and outlet ball check valves. These valves often look like small cylinders attached to the pump head on the inlet and outlet lines. Many similar pump-like mechanisms for moving volumes of fluids around use check valves such as ball check valves. The feed pumps or injectors which supply water to steam boilers are fitted with check valves to prevent back-flow. Check valves are used in many fluid systems such as those in chemical and power plants, and in many other industrial processes. Typical applications in the nuclear industry are feed water control systems, dump lines, make-up water, miscellaneous process systems, N2 systems, and monitoring and sampling systems. In aircraft and aerospace, check valves are used where high vibration, large temperature extremes and corrosive fluids are present. For example, spacecraft and launch vehicle propulsion propellant control for reaction control systems (RCS) and Attitude Control Systems (ACS) and aircraft hydraulic systems. Check valves are also often used when multiple gases are mixed into one gas stream. A check valve is installed on each of the individual gas streams to prevent mixing of the gases in the original source. For example, if a fuel and an oxidizer are to be mixed, then check valves will normally be used on both the fuel and oxidizer sources to ensure that the original gas cylinders remain pure and therefore nonflammable. Some types of irrigation sprinklers and drip irrigation emitters have small check valves built into them to keep the lines from draining when the system is shut off. Check valves used in domestic heating systems to prevent vertical convection, especially in combination with solar thermal installations, also are called gravity brake. Rainwater harvesting systems that are plumbed into the main water supply of a utility provider may be required to have one or more check values fitted to prevent contamination of the primary supply by rainwater. Hydraulic jacks use ball check valves to build pressure on the lifting side of the jack.